We’re making more memories over at chez moi. Tons of fun, lots of friends, and very yummy…. you know, the best kinds of memories! And I do believe that a good time was had by all! Not all of EJ’s little girl-friends were able to make it, and his one best guy-friend was kept at home by a sick mommy (we hope you feel better, Mrs. Evans!). But the crew that gathered did enough decorating for them all. We had an expert frost-er, a patient decorator, and the kid who dumped sugar and sprinkles very liberally over everything he saw. Guess which one was my kid. And you can’t tell from the pictures, but more cookies really were decorated than eaten. I wish I had a wonderful new recipe for sugar cookies to share with you… I really do. But the 3-day ordeal that ended in me running to the store at 6:30 in the morning to purchase a mix to bake up the cookies we actually decorated left me with no recipe to share. I’d actually be able to start a new blog (not just a post – a whole blog!) with only the bloopers and outtakes that this activity alone provided me. 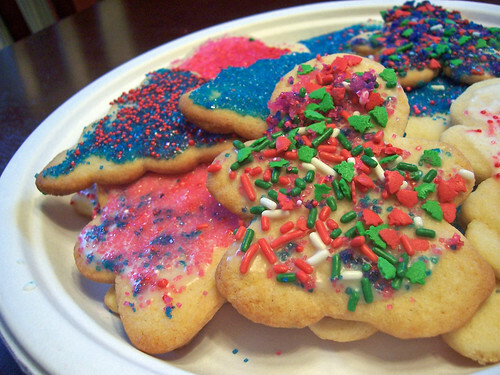 But look at their masterful creations… this just screams Christmas-time to me (it also screams sugar-high… look at how thick the sugar sprinkles are encrusted on those cookies! You know those are going to give you a good crunch when you bite in!). I hope that my boys will always treasure these times together, laughing and spending time in fellowship with family and friends. 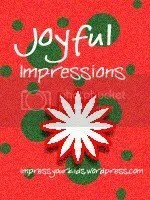 Want to join in our Joyful Impressions? Just post a fun Christmas-y tradition, craft, recipe or activity on your blog. After posting, just click the Mr. Linky below to add the link to your post (not the link to your blog, but to your actual post). And just to be nice, link back to this post, so others can participate, too! 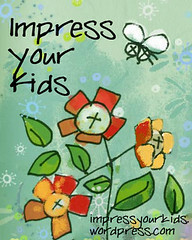 When you’re done, come back and look at the other posts and find some more fun stuff to do with your kids! Just a little last minute turkey craft for you and the kids. No spiritual value whatsoever. But yummy? Oh yeah!! Click here to see my vlog about it! 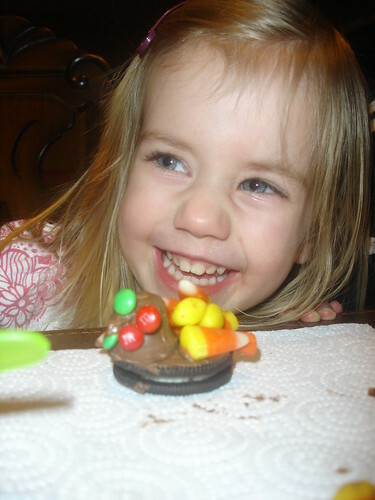 So, do you have a fun Thanksgiving craft, tradition, recipe or activity to share? You know, one that actually works? 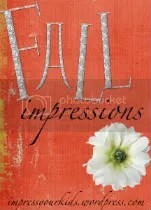 Well, link up with today’s Fall Impressions Carnival! Just write a post on your own blog about a great fall/autumn/thanksgiving activity. Make sure this idea is kid-friendly and ideally shows your kids the truth about the season or impresses God’s Word on their hearts. After posting, just click the Mr. Linky below to add the link to your post. (Not the link to your blog, but to your actual post.) And just to be nice, link back to this post, so others can participate, too! Bananas, berries, and a blender. Well, the title pretty much says it all. Throw in some yogurt, some juice, a little drizzle of honey, and some help from Uncle Drew, and you get our B activity of the day! A banana-berry smoothie, and a very happy EJ.